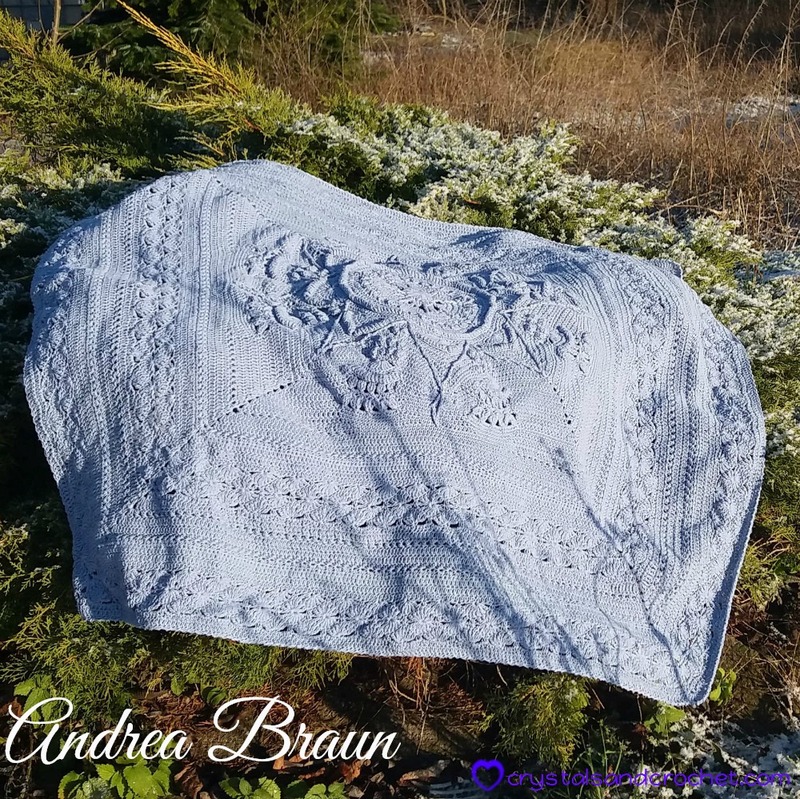 Originally designed in 2015 and commissioned by Willow Yarns in the USA as a written only pattern in US terms, this pattern and the yarn pack are still available from Willow Yarns. However….. I have re-written the pattern, it has now been thoroughly tested by my amazing team of testers and is also now available to purchase in my Ravelry store in both UK and US terms, as either a photo tutorial, or written pattern. I have edited this original post and added all the new links and information. 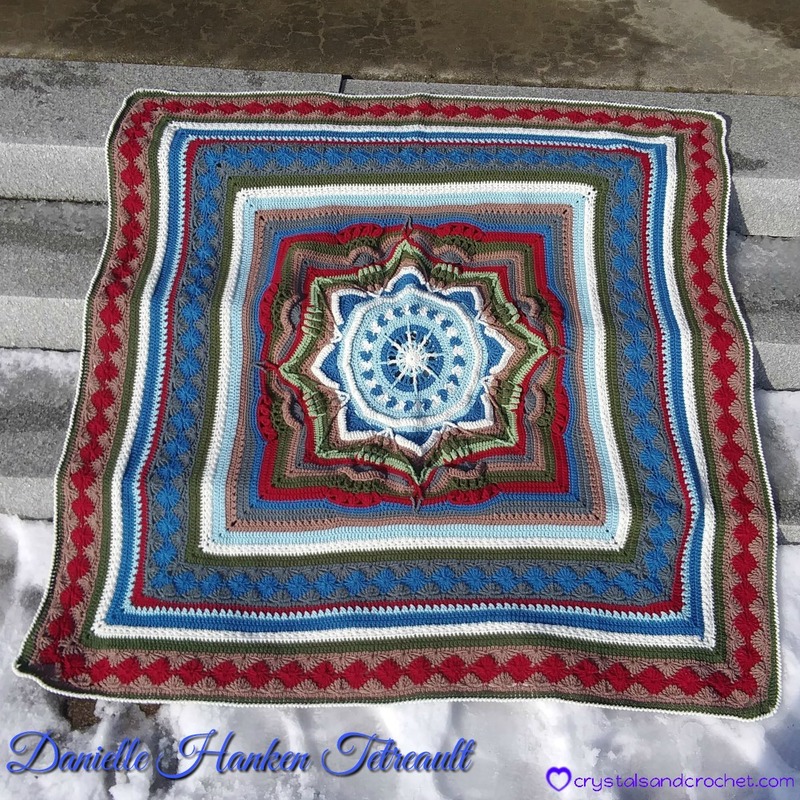 I was commissioned by Willow Yarns in the USA to produce a design, and write the pattern, for a throw/afghan with textured stitches. So this was not going to be just a simple pattern repeat, and as I just love working with texture I was raring to go! As is my way… I waited for some inspiration, and sure enough within a couple of days, I had so many dreams about the sun and the eclipses that were coming up earlier this year. I knew the Solar theme was very important and as the Sun is our Star, the idea of an eight pointed star was born. The photo below was my “draft” and I have now made it into a wall hanging as I did not complete this one to full size. The colours I started with, red, orange, yellow, white were all very fiery colours and a touch of the earth in brown and stone. 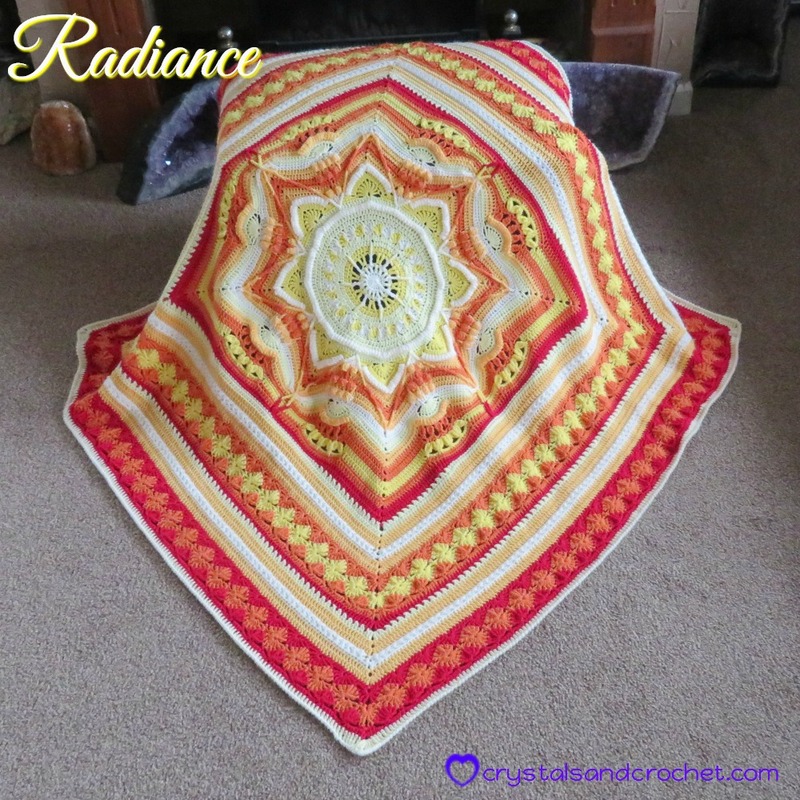 Starting with a central “sun” and radiating out, hence the name “Radiance”. I have used front post stitches, popcorns, folding single crochet and a round of fan stitch within the central star. Then clusters fan out like solar flares, until the design becomes square. The outer rounds are made up of crossed double crochet, star stitch and starburst stitch. I finished this with an extra round of treble crochet and folding single crochet to give a border and then looped it to a frame of Beech wood. This was the finished throw. The photo is taken at the amazingly beautiful and tranquil Lyde Gardens in Bledlow Bucks. However the lovely folks at Willow Yarns wanted this design for their 2016 Spring/Summer catalogue and so wanted really bright colours. Though they love the “fall” colours of the draft it was time to choose bright summery colours. Yarn: Willow wash, you can see the full range here. Colours: 2 Buttercup, 2 Spearmint, 2 Blueberry, 2 Clear Water, 2 Celestial, 2 Sapphire, 2 Lavender, 3 Hyacinth, 2 Azalea, 2 Cooked Quince, and 2 Lurid. The finished throw is just over 60 inches square. Here is the link for the yarn pack. Willow yarns do ship to anywhere and I highly recommend this yarn and they are a great bunch of people, so please do check them out and let me know what you think if you try any of their yarns. For my re-write of the pattern and to be able to offer you all photo tutorials I chose to work with my all time favourite yarn Stylecraft Special Dk 295m/322yds per 100g. Colours: 2 Cream, 2 Lemon, 2 Citron, 2 Saffron, 2 Spice, 2 Lipstick. Yarn packs are available in my Deramores store, and from the lovely team at Woolfull. The Woolful team ship worldwide and are a very small family run business with great customer service. The re-written pattern is now available in my Ravelry store, and is available as a photo tutorial or written pattern in either US terms or UK terms. For those of you following my colours, or if you wish to use your own colours here is a pdf to download and print with the amount and colours used for each round. These are the Radiance throws made by my fabulous testers. You will find all the details of the yarns and colours they used on their Ravelry project pages which I have linked below. ♥ Please remember my patterns are all covered by copyright law and may not be copied or shared in any way. You may share a link to my website or Ravelry store with anyone, you may print the PDF for your own use, but please do not alter, change or share in any way. ♥ Please feel free to sign up to my YouTube channel for lots of helpful video tutorials. I purchased this pattern and found that round 24 in the pattern was giving me a problem. After a bit of crochet, pull out, and crochet again I found that the pattern was incorrect, but thankfully figured it out. Thank you, that was a big help. I am loving this design and can’t wait to finish and enjoy my blanket. Hi Helen. I bought the pattern from Willow Yarns, before you released it on Ravelry, and I cannot find the etera notes. If they are included only with the purchased pattern in Ravelry, then I cannot get them without purchasing the pattern a second time. Help, please. Hi there! 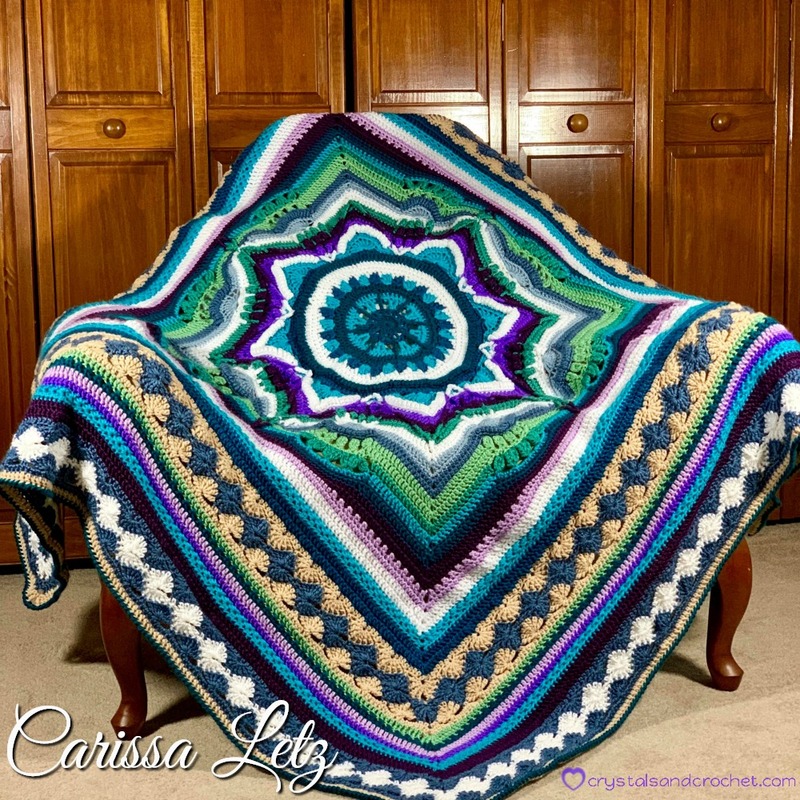 This is a gorgeous blanket! I’m wondering if you can tell me how many rows or rounds total are in this pattern? Thanks! Have you any idea of the postage costs of the pack to the uk ? Is this pattern in the same detailed format as your dream weaver with photos ? I love the orange version – do you hve a list of the colours you have used in that one as well as the quantity needed of the alternative colours. Radiance is a written only pattern, no photos! I designed it for Willow Yarns. Dear Helen, I want to buy the Radiance Blanket. But I´m living in Mexico and in the Willow Yarn page there is no possibility of shipping to Mexico . Is it possible to buy the kit on another page ? Thank you Helen! This design is so beautiful! I just purchased the written pattern and joined your blog! I love to crochet, yet there doesn’t ever seem to be time to make something for ME 🙂 When I saw this I knew it was time to crochet something for myself. I can’t wait to get started!! thank you very much for your wonderful work and for your generosity in sharing. 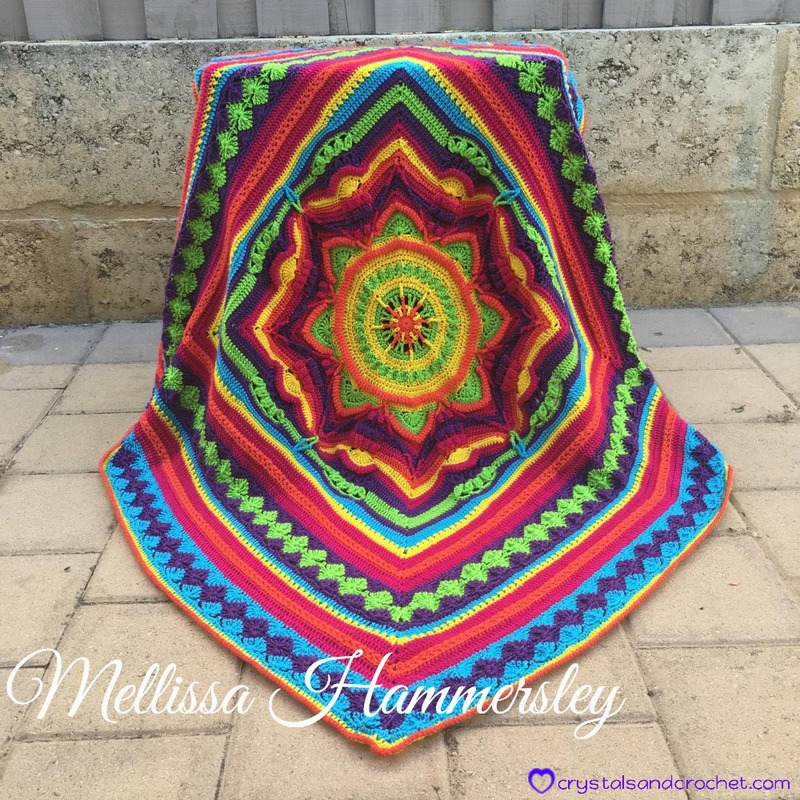 At present I am doing the Mandala Madness and that makes me very happy. Is it possible to notify us when the Radiance pattern is for sale? I think a very beautiful work. Hello Helen, cant wait for your new Cal. Your work is beautiful. Thanks to that post on Facebook, I discovered you and Frank both! The rest my year is planned projects, but come January I am stalking both of y’all blogs and designs! Very nice design. It is good to see more designers stepping outside of the box. Someone on Facebook had posted an early photo of your work trying to find who designed it. People kept saying that it looked like something I would do. Thank you Frank 🙂 not an in the box kinda girl me!! like you I get bored with all the same stitches! I would dearly love to have a go at this pattern. Where can I go to get it, PLEASE?????? It will be available through Willow Yarns in Spring next year 2016. Sorry there is going to be a wait. Hi Maureen, this will be released as a written pattern by Willow Yarns in the spring, so no video but some of the special stitches will be here in my tutorials.